Scraps of flannel plaids and stripes were used to make the 12 off-center log cabin blocks that finish at 3 3/4". The finished quilt size is 19" x 23", just right for a doll quilt or table topper. I started my pattern company, Carol Hopkins Designs, in 1999 with the pattern “Little Nieces” that was based on quilts I made for the American Girl dolls my 5 nieces received for Christmas. 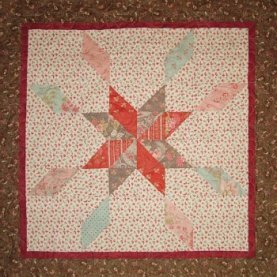 All of the patterns in my two pattern lines—Civil War Legacies and Vintage Legacies—focus on pieced quilts using 18th and 19th century reproduction fabrics. most blocks in our sampler quilts using templates that we made ourselves and hand quilted everything because there was no such thing as long-arm machine quilting. Baskets for Betsy is my favorite, but Gettysburg Sun, Tomorrow Scarlett, Tribute to Judie, and Remembrances are close runners up. 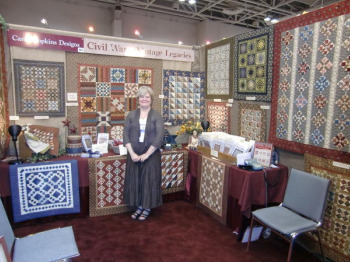 Being complimented on my quilts by Judie Rothermel, my quilting idol. inspired the names of some of my quilt patterns—Edward’s Quest, Timothy’s Song, Emily’s Memories, Michael’s Victory, Small Joys, Allie Beane, and Mo’s Suspenders.